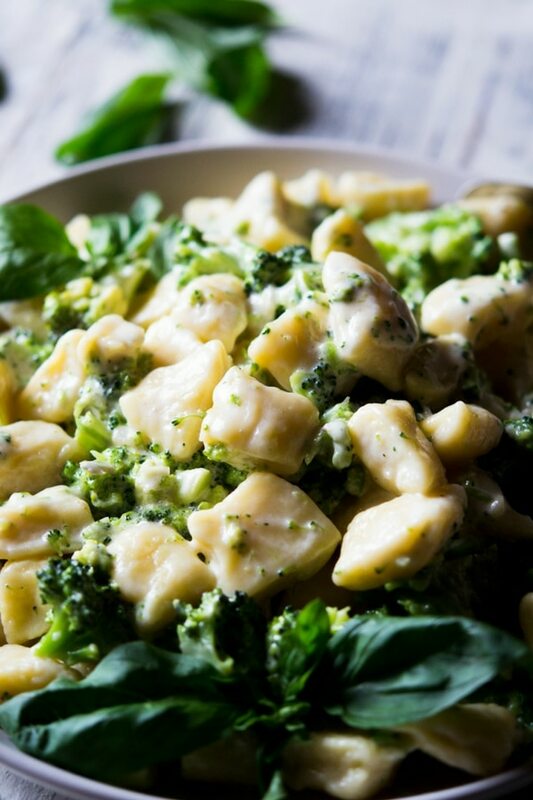 Easy homemade ricotta gnocchi served with a delicious broccoli cream and parmesan sauce. You won’t believe how easy it is to make these ricotta dumpling from scratch and how light and delicious they are. This sauce btw...aaaamazing! Ricotta gnocchi is something you’ve gotta try! Homemade gnocchi are something I love to make. When done right they are light as can be, soft and pillowy. Serve them with you’re favourite pasta sauce and the whole meal is damn right heavenly!…serious comfort food. The problem is homemade potato gnocchi can be quite tricky and fiddly to make from scratch. You need to choose the perfect potatoes for the job and even a hint of too much flour and you can kiss goodbye so soft, light gnocchi and say hello to heavy, stodgy little bricks….no thanks! So how can we make sure our gnocchi is soft and light every time? MAKE ricotta gnocchi! Oh yes, skip the potatoes and use ricotta instead. Not only is the outcome much easier to control, the whole recipe is SO much easier and quicker. Tip: The trick to making the best ricotta gnocchi is to use as less flour as possible. Always add the flour a little at a time so you can keep an eye on the texture of the dough. 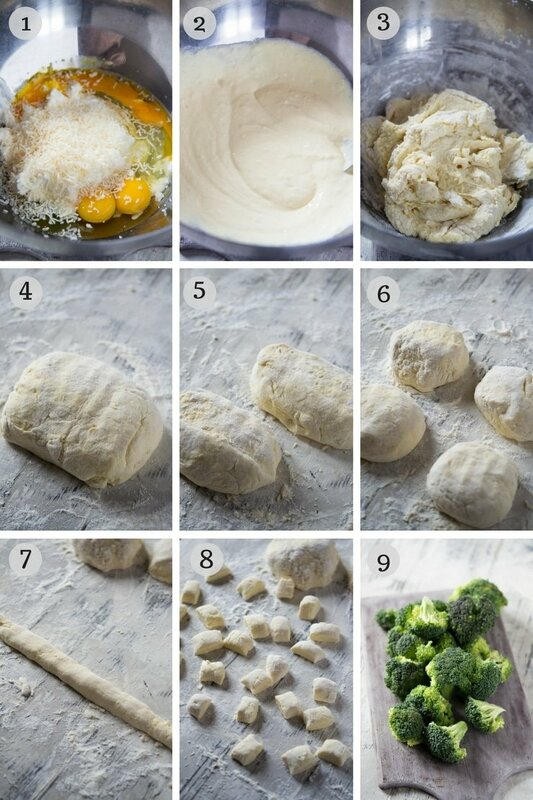 Add all the gnocchi ingredients apart from the flour in a large mixing bowl and stir with a wooden spoon or spatula until thoroughly combined (photos 1 & 2). Gradually add the flour while stopping to fold it into the ricotta mixture. Keep doing this until a soft dough forms (photo 3). Tip: I find the amount of flour needed depends on the creaminess of the ricotta (some can be wetter than others). Keep adding the flour until the dough is soft and easy to handle without sticking to your hands. Dust a work surface with flour and tip the dough out from the bowl. Shape the ricotta gnocchi dough into a rough rectangle log shape and cut it in half. The dough will be quite sticky at the edges you cut so always dust the knife with flour before cutting and then lightly dust the cut edges (photo 4 & 5). Divide each half in half again so you have 4 pieces of dough (photo 6). Carefully roll each piece of dough into a long log that’s around 1/2 inch to 1 inch (photo 7). Cut each rolled out log into gnocchi (small-medium sized) and set them aside on a flour-dusted chopping board or surface. Bring a large pot of salted water to a boil. Cut the thick stalk off the broccoli so you only have florets left. Add them to the boiling water for 1 minute then remove with a slotted spoon and set aside (keep the water boiling). Finely chop the garlic and fry it in a little olive oil in a large pan. Roughly chop the broccoli into small-medium pieces and add to the garlic. Fry for 30 seconds to 1 minute then add the cream, nutmeg and salt and pepper. At this point add the gnocchi to the boiling water. Bring the cream to a boil then add the parmesan. Keep the sauce simmering until it started to thicken then remove the gnocchi from the water with a slotted spoon and add to the sauce. Toss to coat in the sauce, season with more salt and pepper and serve. Serve the sauce over steak (I normally omit the broccoli and add a little extra parmesan & serve with these fried gnocchi). 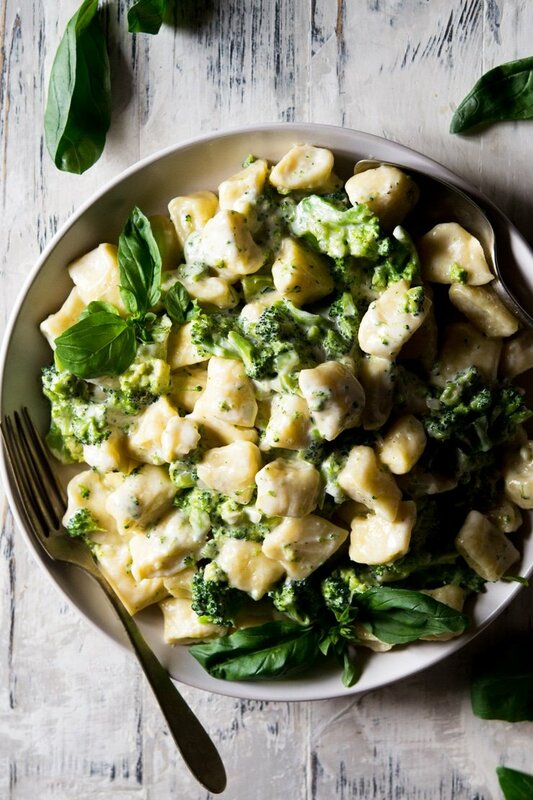 If you’ve tried this easy homemade gnocchi with broccoli cream sauce or any other recipe on the blog then don’t forget to rate the recipe and let me know how you got on in the comments below, I love hearing from you! You can also FOLLOW ME on FACEBOOK, TWITTER, INSTAGRAM and PINTEREST to see more delicious food and what I’m getting up to. 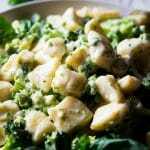 Easy homemade ricotta gnocchi served with a delicious broccoli cream and parmesan sauce. You won't believe how easy it is to make these ricotta dumpling from scratch and how light and delicious they are. Add all the gnocchi ingredients apart from the flour in a large mixing bowl and stir with a wooden spoon or spatula until thoroughly combined. Dust a work surface with flour and tip the dough out from the bowl. Shape the ricotta gnocchi dough into a rough rectangle log shape and cut it in half. The dough will be quite sticky at the edges you cut so always dust the knife with flour before cutting and then lightly dust the cut edges. Divide each half in half again so you have 4 pieces of dough (photo 6). Carefully roll each piece of dough into a long log around 1/2 inch to 1 inch thick. The amount of flour will depend on how wet the ricotta is an how large your eggs are. Keep adding a little at a time until a dough forms. Always use as less flour as possible and dust your hands to prevent the dough from sticking when rolling. I like to sieve the flour into the ricotta so it is totally lump free. “Carefully roll each piece of dough into a long log around 1 inch x 1/2 inch.” Do you mean 1 foot by 1/2″? 1 inch isn’t very long for a log. Hi Bunny, thanks for pointing that out. I meant roll the dough out into a log that’s 1/2 inch to 1 inch thick. Sorry about that, updating the recipe now. 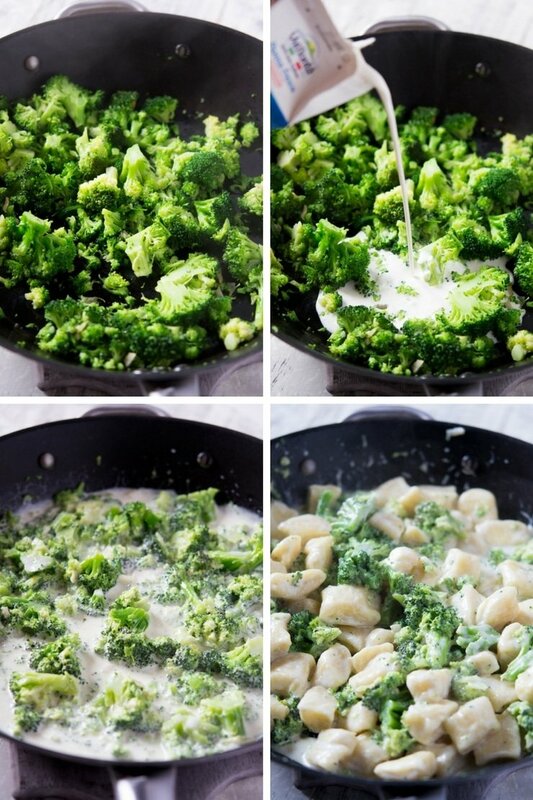 I have never tried ricotta gnocchi before but I’m sure I would love it; especially with the broccoli and cream sauce! YUM x 1000!!!!! This recipe looks unbelievably delicious! I can’t wait to make it- I love that the ingredient list is short and easy. Thanks for the great recipe!!!!! There’s not much more I love more than homemade gnocchi and I always have some in my freezer. I’ll be trying them with this sauce soon. this looks great! I’ve had so many disasterous attempts at gnocchi before but I reckon I could pull this off! OMG! So much goodness. Save me a plate! You make it look so easy and so, so delicious! I’ve never had ricotta gnocchi but this looks fabulous and I can only imagine how delicious it is! This sounds amazing! I’ve been wanting to try gnocchi and I love that you made it with ricotta. Can’t wait to try this recipe. Thanks Stephanie, you should definitely give it a go soon!